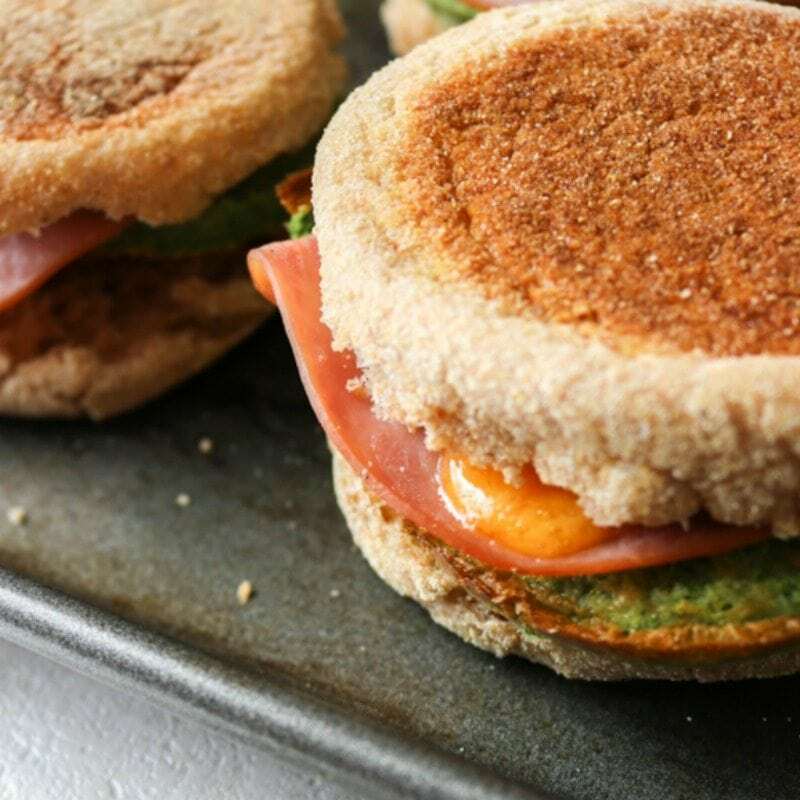 Green Eggs and Ham Breakfast Sandwiches: Naturally “dyed” with spinach, this recipe for green eggs and ham are served up with sharp cheddar cheese in a portable breakfast sandwich that is easily made ahead and freezer-friendly. Did you all happen to see my daughter and I make Green Eggs on a facebook live demo? We were chatting about how to easily incorporate some sneaky veggies into our diets and these Spinach Eggs, along with Veggie Tostadas, were top on our list! I make naturally dyed green eggs every year for Dr. Seuss’ birthday and serve them up with my Cat in the Hat Pancakes. Well, you all LOVED the spinach eggs so much, I thought it was the perfect time to serve them up as Green Egg and Ham breakfast sandwiches. 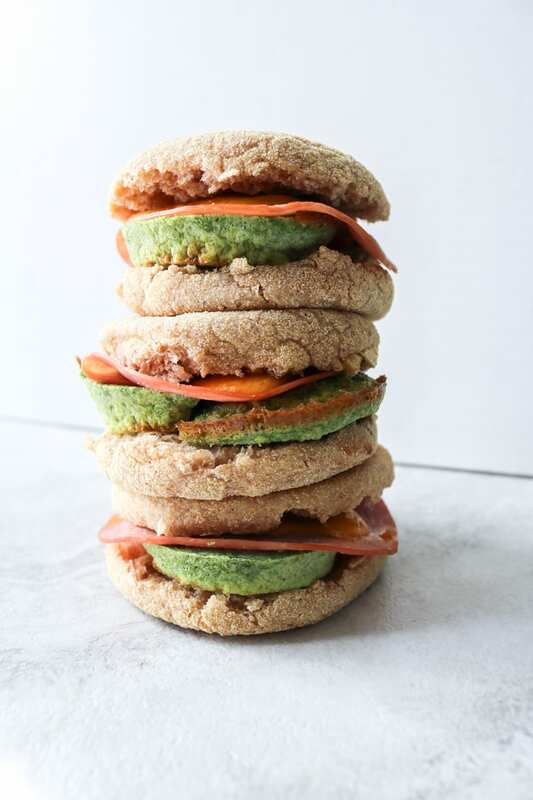 That and these Green Eggs and Ham Sandwiches make the perfect make-ahead, freezer-friendly breakfast that you can eat on the go. And if you are like me, there are MANY mornings, time gets away from you and you need a healthy grab-n-go breakfast. But breakfast is essential, isn’t it? Yep, that’s why I have more than one healthy breakfast recipe perfect for busy mornings. These Spinach and Ham Breakfast Sandwiches NEED to be become your new go-to. They are easy, healthy, and full of protein. And just fun! Think about the conversations you will have about Sam I am and Green Eggs and Ham while sitting in car rider lines with your kids! But these English Muffin Egg Sandwiches are not just for kids–adults love them too. Yes–even picky adults who don’t like greens! The spinach in these eggs blends perfectly into them, leaving no taste of spinach at all. Plus when you add ham and cheese–who can resist? Traditionally these sandwiches would be made with Canadian Bacon (well, Americanized Canadian bacon–this Canadian knows REAL Canadian Bacon). I changed it up and made these sandwiches with ham. Why? It is cheaper and easier to find quality ham that is nitrate free. I also subbed out american cheese slices for sharp cheddar and white english muffins for whole wheat english muffins. So make up a batch of spinach egg breakfast sandwiches. And then freeze for busy mornings. A healthy breakfast is as simple as grab, reheat and go! Assemble as directions state without toasting the English Muffin. 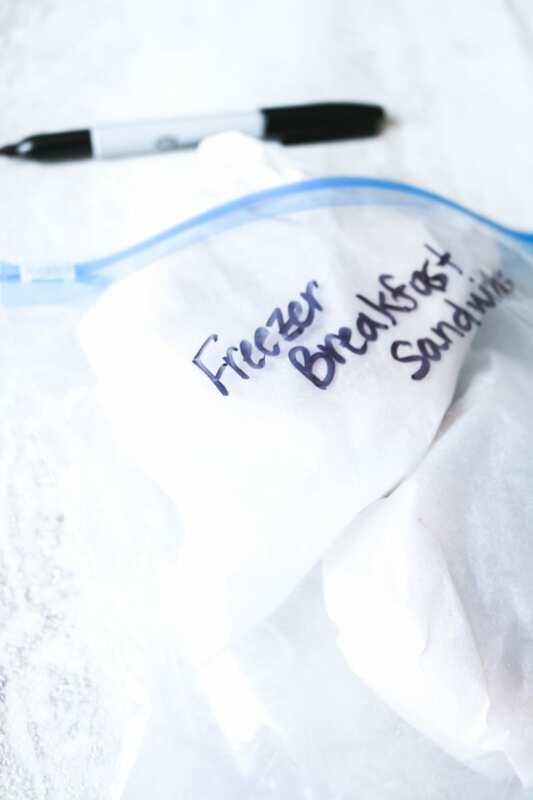 Place each breakfast sandwich large freezer bag. Seal and freeze for up to 6 weeks. To reheat egg sandwiches, place on plate and microwave frozen sandwich for 1-2 minutes on high in microwave. **Alternatively, you can wrap each sandwich in parchment paper and place in freezer bag to freeze and reheat on parchment paper verses a plate. A spinach, ham and egg breakfast sandwich. 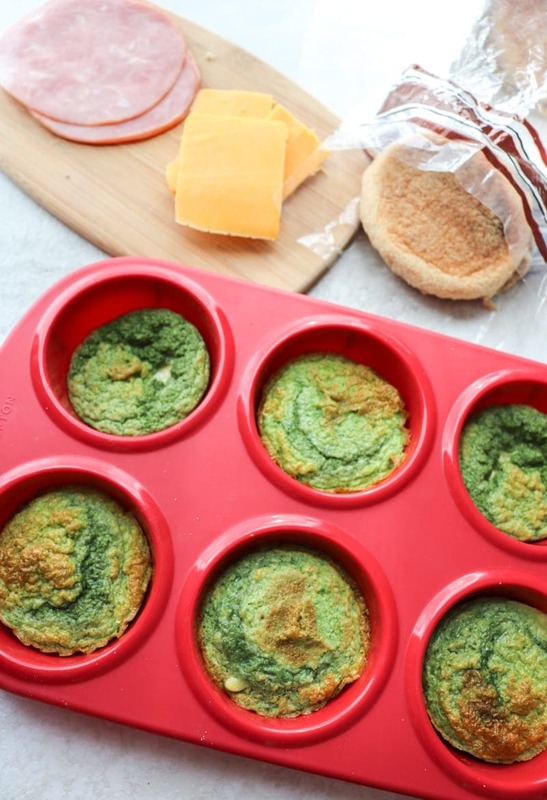 Line a muffin tiin with silicone liners or use a silicone muffin pan. In a blender, blend eggs, spinach, cottage cheese, and pepper until smooth. Pour evenly into muffin liners and bake for 10 minutes. Pop eggs out of liners and allow to cool. 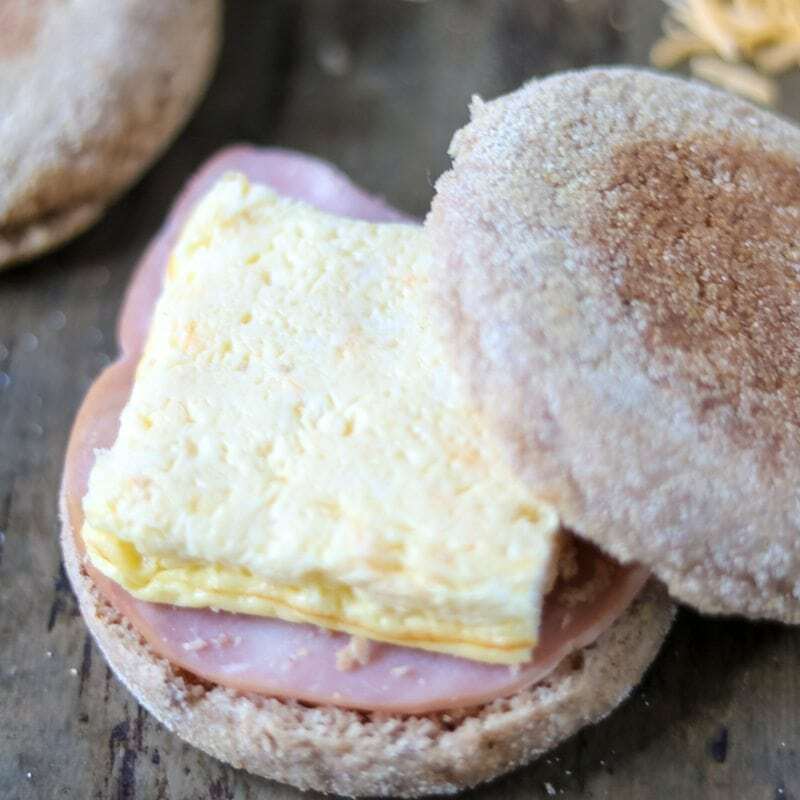 Place a slice of ham and cheese on each english muffin bottom and top with egg and remaining half of english muffin. Wrap individually in parchment paper or plastic wrap and place into freezer safe bag. When ready to eat, grab from freezer and heat in microwave for 1-2 minutes.